A good number of people have wanted to resize their nose for centuries and for various reasons. A big nose usually looks ugly and affects the overall look of a person, giving birth to depression and gloominess. Majority of people found their way to painful and expensive nose surgeries in order get the nose they’ve always wanted . However, there are many simpler and less expensive methods to get smaller nose without surgery, which are not that hard to follow when you have right equipment and knowledge. Therefore, read the simple steps given below and get a smaller nose without surgery. You can get smaller nose with a proper application of foundation cream and nose contouring. Splash your face with water and place some fine quality cleansing cream on your palm. Now, spread it all over your palms and apply it to your wet face in upward circular strokes. Massage it for 5 to 10 minutes until the pores of your face are clean. Rinse the cleanser with cold water and wipe your face dry. Apply moisturizer to your face and wait for 2 to 3 minutes until your facial skin absorbs it thoroughly. Note: Do not use an excessively oily moisturizer as it gives an ugly look. 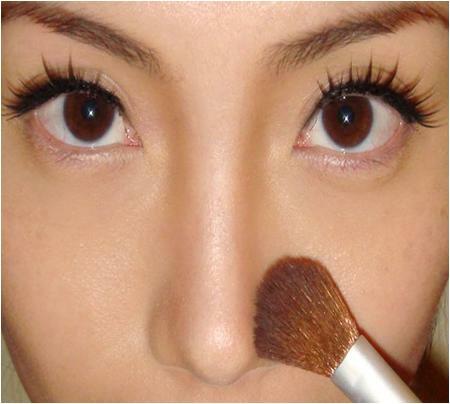 Pick a small makeup brush, dip it in light foundation and apply it to the top and bottom of your eyes. It helps in lightening the dark eye circles in order to highlight your nose contouring. Note: You can use a concealer as well as it is useful in lightening the dark circles. Dip a large makeup sponge into a medium shade of foundation powder and apply it to all your face. Blend the foundation for a few seconds until you attain a natural look. Now, it is the time to contour your nose. Use a dark shade of foundation and a specially designed contouring brush for the contouring of your nose. Note: If the tip of the countering brush is not well defined then you have to give it a proper shape. Dampen the tip of the brush with a few drops of water and remove the excess water with a clean towel or tissue paper. Now, shape the tip of the brush according to your need. Dip the brush in the darker foundation powder and apply it to the edges of your nose on both sides, starting from the eyebrow lines and ending on the nose tip. Note: Do not draw too thick lines. Grab a medium clean makeup sponge and blend both of the foundation line into the makeup surrounding of your nose. Apply a thin coat of face powder to your entire face to give a nice finishing touch to your nose contouring. Apply a simple eye makeup and lipstick to conclude the whole makeup process nicely. Diverting others’ attention from your big nose is another effective method. All that you have to do is, apply bold lipstick and drag the eyes to the mild contours of your mouth and away from the nose. Secondly, highlight your eyes with eye-liner, mascara and eye-shadow. Thirdly, open hair hang on the sides of your face and cover your face, highlighting the center of your face - your nose. 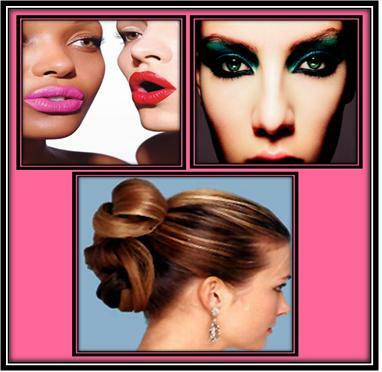 Therefore, Hair Updos will provide more face area, making your nose appear smaller as compared to your face. Note: Never make the mistake to wear bold eye-makeup and lipstick together as it gives a clowning look. Therefore, keep one of the makeup light and the other bold. Fix your nose with a uniquely designed nose huggie, an inventive modern device especially designed to reduce the size of your nose. It is easy to use and gives positive results. Read the instructions on the packet of the nose huggie and use it accordingly. Some simple nose exercises are also helpful in re-sizing your big nose. Place either right or left thumb on one of your nostrils and the index finger on the other nostril. Now, softly pinch your nose, pressing only enough to give some resistance. Hold your nose in this position for 15 to 20 seconds. Repeat this simple nose exercise for approximately 10 times per day and see the difference within two to four weeks. 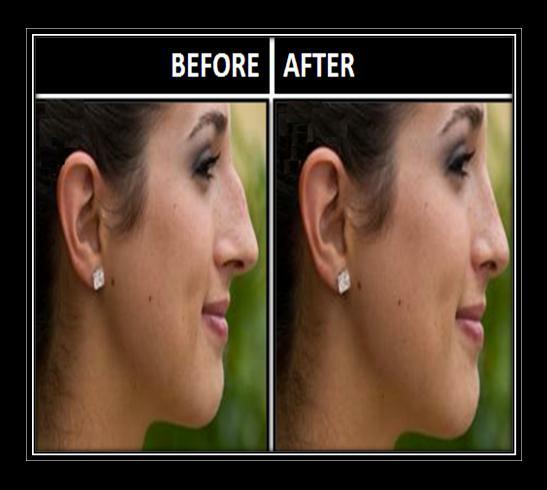 Make nose smaller without surgery try to use nose right tool which is help you to make nose smaller and sharp.